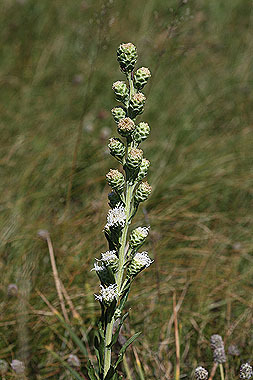 Flower heads of Rocky Mountain Blazing Star appear in a loose spike along a tall stem. Flowers are purple-pink (occasionally white) and stems are reddish. Involucre bracts have rounded tips. Leaves are narrow. Rocky Mountain Blazing Star is uncommon. 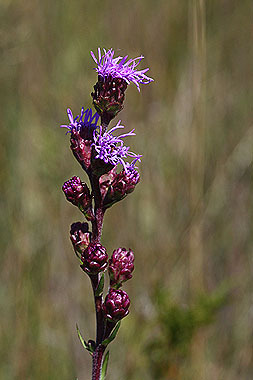 Compare to the much more common Liatris punctata (Gayfeather), which has smaller flower heads and pointed tips on the involucre bracts. Stems of Gayfeather have more leaves and more numerous flower heads.